Alex Perry is the author of The Good Mothers: The True Story of the Women Who Took on the World’s Most Powerful Mafia. The idea that the Italian mafia is no historic legend but a murderous present-day global threat that earns US$50-billion to US$100-billion a year from protection, embezzlement, drugs and money laundering is news to most of the world, but not Canada. When a gunman shot dead Cosimo Commisso, 33, and Chantelle Almeida, 26, through the driver’s window of Mr. Commisso’s white Mazda SUV while they were parked in a suburban street of Vaughan, Ont., at 12:45 a.m. on June 29, the pair became the latest victims of an Italian mob war that has claimed at least 15 lives in Eastern Canada in the past decade. The same period has seen Toronto emerge as a global hub for Italian mafia money laundering. The past five years, meanwhile, have witnessed a series of busts of cocaine, heroin, ecstasy and fentanyl traffickers, co-ordinated with more arrests in New York, Italy and Latin America. Those operations have exposed how Toronto-based clans of the Calabrian mafia, the ’Ndrangheta, are replacing those of the Sicilian mafia, the Cosa Nostra, as the dominant force in illegal drug trafficking in North America. The same picture emerges from the case of the three Coluccio brothers from Siderno in Calabria, bosses of a powerful ’Ndrangheta clan, two of whom, Giuseppe and Antonio, settled in Toronto for several years. In 2008, Giuseppe was arrested and deported to Italy, as part of a mass international arrest of a gang trafficking cocaine through Mexico to the United States and Italy. Last week, Antonio was sentenced to 30 years in Italy for extortion and mafia association. As the evidence accumulates, it’s becoming harder to argue with the conclusion of law-enforcement officials the world over: that Canada, especially Toronto, is now on the front line of a new war against the rise of global organized crime. 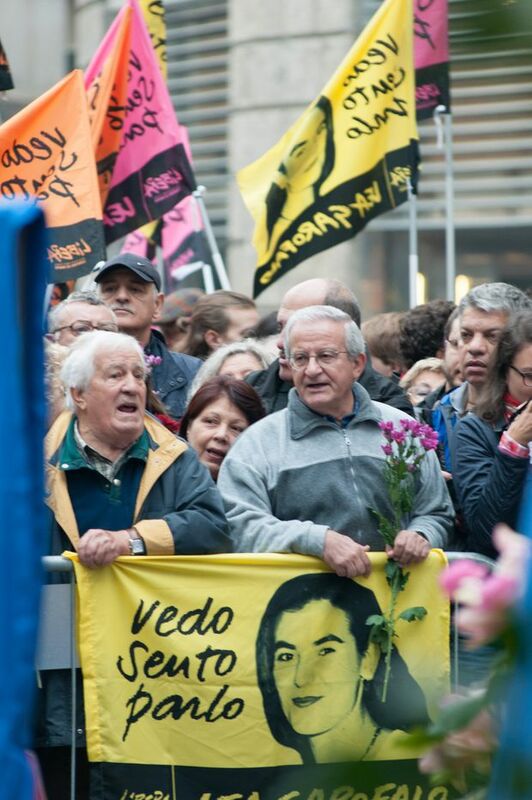 The funeral of Lea Garofalo in Milan in 2013. For most of its existence, the authorities considered the ’Ndrangheta a poor cousin to the other two mafias, country bumpkins in dusty suits and trilbies who might shake down the local trattoria but never strayed far from their lemon groves. The testimony of Lea Garofalo, her daughter Denise, Giuseppina Pesce and Maria Concetta Cacciola blew apart that cozy fantasy. As a result of their evidence – for which Ms. Garofalo and Ms. Cacciola would later pay the ultimate price – and other investigations that followed it, Calabria’s prosecutors concluded that the ’Ndrangheta was the most powerful organized-crime syndicate on the planet. It had a presence in 120 countries and a global income that, at its upper estimate, accounted for 3.5 per cent of Italian GDP, beating Microsoft’s annual revenue by US$10-billion. It ran 70 per cent of the cocaine in Europe. It sold weapons to several sides in Syria’s civil war. It even dumped nuclear waste in the sea off Africa. But it was the ’Ndrangheta’s money laundering, cleaning their own wealth and that of other organized crime groups, that meant it was in everyone’s lives. We work in its companies, live in its buildings, shop in its stores, eat in its restaurants, trade in its shares and elect politicians it funds. Giuseppe Lombardo, a Calabrian prosecutor specializing in the ’Ndrangheta’s finances, told me that the group occupied a “fundamental and indispensable position in the global market … more or less essential for the smooth functioning of the global economic system." The secret of the ’Ndrangheta’s success is secrecy itself – or, as they call it, omertà. That’s built on a claustrophobic, cult-like family culture that shuns outsiders and is meant to make betrayal unthinkable, since for an ’Ndranghetista to speak out means hurting their own kin and abandoning everything and everyone they have ever known. But with that 19th-century clan structure has come 19th-century morals. Girls are viewed as chattel. They are pulled out of school to be married off at 13 or 14 in clan alliances. They are prevented from leaving the house unaccompanied by a man. Beatings are routine. And if they are unfaithful, they can expected to be killed by their own father, brother or son and to have their bodies dissolved in acid to erase the family shame. Several prosecutors I spoke to drew parallels to the wives of jihadis in groups such as the Islamic State or Boko Haram. Ms. Garofalo testified to try to secure a new life for herself and her daughter, Denise. Encouraged by a female state prosecutor, Alessandra Cerreti, who, all but alone among her male colleagues, understood that the mafia’s women were not just its victims but goldmines of information with a genuine reason to speak out, Ms. Pesce and Ms. Cacciola also turned state’s evidence in return for a new beginning for them and their children. Ms. Garofalo’s statements exposed the world of the ‘Ndrangheta to the state almost for the first time. Ms. Cacciola helped the police solve several murders and find underground bunkers where ’Ndrangheta bosses lived on the run. Ms. Pesce’s evidence laid bare her clan’s inner workings in such detail that the most powerful family in the ’Ndrangheta – 64 members of the Pesce clan – was rounded up and destroyed and €260-million ($400-million) of its assets confiscated, including two soccer teams.